We are pleased to inform you that we have increased the total allocation that clients can invest in foreign assets within Living Annuity and Endowment accounts and have improved the way we manage foreign exposure in these accounts. This is effective today, 5 April 2018. In the February 2018 budget speech, National Treasury announced a 5% increase in foreign asset allowance for institutional investorssuch as Allan Gray Life. This increase, combined with a stronger rand, means that we are able to increase the total allocation that clients can invest in foreign assets to 60%. Going forward, this increased limit will be managed based on each account’s overall foreign allocation, taking into account the foreignal location in each underlying unit trust. Each account’s existing allocation to foreign assets will be taken into account as shown below. Existing account with more than 60% in foreign assets* Clients may transact provided they maintain or reduce their current foreign asset percentage. New investment lump sum Maximum of 60% in foreign assets. Existing debit orders No change required. *If the account’s foreign allocation is reduced, it cannot be increased again by future transactions. 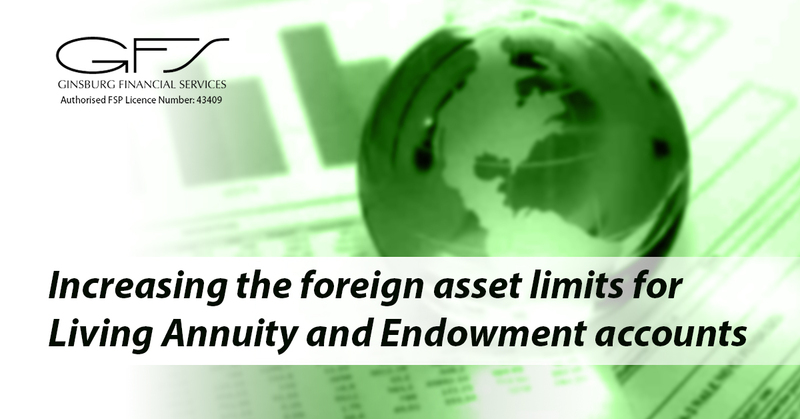 Why are we not completely lifting the restrictions for the Living Annuity and Endowment? Our aim is to manage foreign limits at a level that we believe can be maintained for a reasonable period of time under a gradual change in the rand-dollar exchange rate and foreign asset returns relative to South African asset returns. It is further important to note that all unit trust management companies that are available on Allan Gray’s platform may now also use an additional 5% in foreign asset allowance. An increase in Allan Gray and third party funds’ foreign exposure over time will use a substantial portion of Allan Gray Life’s additional 5% capacity. While we are working on additional options for solving our capacity constraints in the longer term, if any of these variables change more rapidly to what we have assumed within the next year, we may be required to review these limits. Living Annuity and Endowment transactions performed online will automatically be validated against the 60% rules as outlined in the table. We have also made an offshore allocation calculator available on our website for you to validate any transactions not performed online. Although our unit trust management company, as an institutional investor, now has an additional 5% in foreign asset allowance, most of this capacity is already being used in the Allan Gray Equity, Balanced and Stable funds. The Allan Gray-Orbis rand-denominated unit trusts will therefore remain closed for new discretionary investments. Contact Ginsburg Financial Services for more information.